How to choose laminate floor. Choosing a laminate flooring. Laminate is a good, stylish, and affordable alternative to other flooring options. It has four layers and a decorative one that you actually see can emulate such looks as wood, ceramic, or stone. For many years it has been proving its reliability, durability, and usage. Homeowners install this type of flooring almost everywhere in the house and it can last many years. Laminate has strong and durable surface which is resistant to scratches, stains, and wear. Therefore, this type of floor can stay as good as new even in high-traffic areas and through normal changes in temperature and humidity levels. It cost depends on the thickness and durability of the materials. Laminate is so a trustworthy flooring material nowadays that you can get this flooring warranty for about 20 years or more. In addition, it comes in varieties of colors and patterns that can satisfy any customers’ tastes and needs. 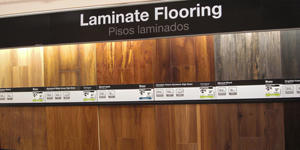 Laminate is made from manmade materials. Therefore you should be careful while shopping for new laminate flooring. It is essential to select the right one because you might purchase something very cheap but completely unreliable that must be replaced in a few years. So, before ordering online or buying directly from a retail store, you have to pay attention and consider nor only the cost of laminate flooring, but durability and practical use of a particular product as well. In addition, you might want to ask questions on online forums or your contractor. Even if you are going to install it yourself you still can call them and ask some professional advices to figure out what will work for you best. If you opt for covering your floor with laminate planks yourself, you should weigh all pros and cons of that in order to see whether it is worthwhile. It is not an easy but doable project. However, you need to know your strengths whether you can handle it. If you don’t have any necessary instruments for that project at home you need to figure out whether it will pay you off to rent or buy them and whether you know how to use them properly. For example, it is sort of hard to make exact cuts of a laminate plank with miter and/or table saws even for experts. When you do your measurements of flooring materials necessary for the area in your house that needs to be covered, you have to buy about 5% more of them in order to not be short if you spoil some of laminate planks. To choose the right floor look will help your overall room’s décor (which colors already exist there and which furniture you have or plan to buy for that). You need to consider also which kind of traffic you will have there (heave or light) in order to buy the materials accordingly. Laminate flooring comes in a wide range of sizes, depending on the look it emulates. Normally natural wood look planks are 4 inches or wider. On the other hand, ceramic or stone tile looks range between 12 and 15 inches. Since the width of laminate planks or tile can change the look of a room where it installed, it is necessary to choose appropriate ones. For example, wide width planks or tile can complement a large room. In contrast, those wide widths can look overwhelming in a small one.